The Baltimore Orioles donated $14,000 to the Fort Meade Alliance Foundation as a result of its online auction of special camouflage team jerseys and caps worn during the Memorial Day game in May. This is the fifth consecutive year that the Orioles chose the FMA Foundation as the recipient of the proceeds of its online auction. The Orioles have donated a total of $83,849 since 2011. The Orioles online auction began after the Memorial Day game on May 30 and lasted through June 6. All jerseys and caps worn by the players and manager Buck Showalter were autographed and authenticated. 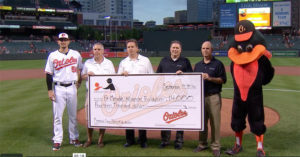 The Orioles presented the FMA Foundation with a check during the September 19 game at Camden Yards. The FMA Foundation has embarked on a significant effort to raise funds to establish a Resiliency and Education Center on Fort George G. Meade. The plan, which is a partnership with the U.S. Army and the Fort Meade Garrison, includes the renovation of the installation’s historic Kuhn Hall and its conversion into a Resiliency and Education Center, which will serve as the hub of information, programming, and services for the Fort Meade Community, focusing on the five areas of resiliency: physical, emotional, social, family and spiritual. FMA Foundation Appoints Two New Board MembersRuth’s Chris donates proceeds from opening weekend to FMA Foundation!